Former Arsenal defender Lauren believes Luis Enrique is the perfect person to replace Arsene Wenger as the club’s manager, according to Sky Sports. Lauren, who was signed from Real Mallorca by Wenger in 2000, was a key component of the Frenchman’s highly successful teams in the early 00s. 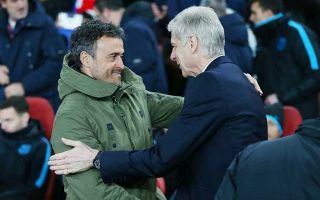 He was part of Arsenal’s double-winning squad of 2001/02 and Invincibles team two seasons later, and he feels former Barcelona player and coach, Enrique, is the best fit because the Spaniard’s style of play would best suit Arsenal’s ethos. In the video below, Sky show Juventus boss Allegri as the current bookies’ favourite, but Lauren responds by explaining why Enrique would be his pick. “I would go for Luis Enrique because of a few facts,” Lauren said to Sky. “The style of play, there are some parallels with Barcelona, the way they play is the ‘Arsenal way’. Would Luis Enrique be your choice? Luis Enrique has been touted as a potential managerial candidate having previously worked with Arsenal’s head of football relations, Raul Sanllehi, at Barcelona. He enjoyed great success at Barcelona as manager, where he won nine titles in three seasons – including: two Ligas; three Copa del Rey; one Champions League; a European Super Cup; a Spanish Super Cup; and a Club World Cup.